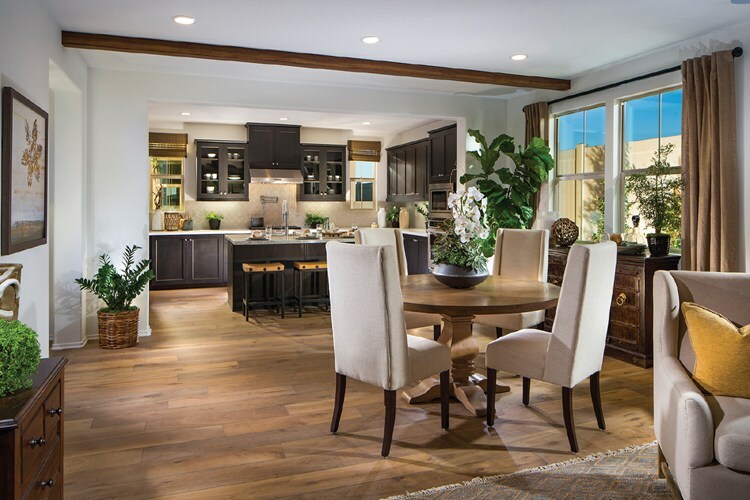 This great room from the Residence Three plan by Broofield Residential in San Marcos, CA exemplifies several of the hot spring design trends experts shared with us -- natural elements, lots of plants and wood in the kitchen! Ready to spruce up your home for spring? We asked 8 leading interior designers to share the latest design and décor styles they are looking forward to this season. Fresh on the forecast: Wood in kitchens, dark green hues, curved silhouettes, marble backsplashes, vibrant wall colors… and yes, floral fashion is bolder than ever. Lori Dennis of Lori Dennis, Inc.
Floral motifs are still going strong this Spring. It's fresh and happy. We continue to see them everywhere from big bold patterns on wallpaper, to fabrics and sinks (from Kohler) and all over the streets in fashion. Avoid the mistake of going too 90's revival and select a pattern with black to make it more modern. We're also seeing a lot of oversaturated color on walls vs. the clean stark white walls that we've seen seeing in sleek modern and modern farmhouse home. Think Teal, Emerald, Ruby and Yellow. And keep your eyes open for Zen and Mediterranean styles as we move away from clean modern and toward a more traditional and decorative interior. About Lori: Lori Dennis, ASID, LEED AP, leads the top interior design firm in Los Angeles, is a speaker, best selling author and star of HGTV’s “The Real Designing Women.” Her firm specializes in luxury, high end interior architecture and healthy living and clean, comfortable, California interiors are a hallmark of her designs. 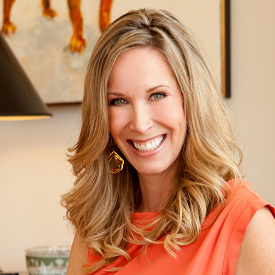 Check out Lori's website here or connect with her on Instagram @loridennisinc. One of my favorite design trends I've been noticing in 2019 is wood making a comeback in kitchens! I am absolutely thrilled about this. Natural materials bring such depth, warmth and innate earthiness to any space and I love that you don't have to worry too much about natural wood going out of style because it is always timeless. About Kate: Launched in 2009, Kate Arends created Wit & Delight as a personal project to get to know herself through sharing her love for design, food, fashion, and travel. In 2013, Arends began publishing personal essays exploring her journey through divorce, mental illness, and an undiagnosed learning disability. 3.3 million followers later, Wit & Delight has become a resource for others to feel less alone in the ups and downs of their journey through life and where readers can find suggestions on where to travel, eat, or shop from someone they’ve come to know as a friend. 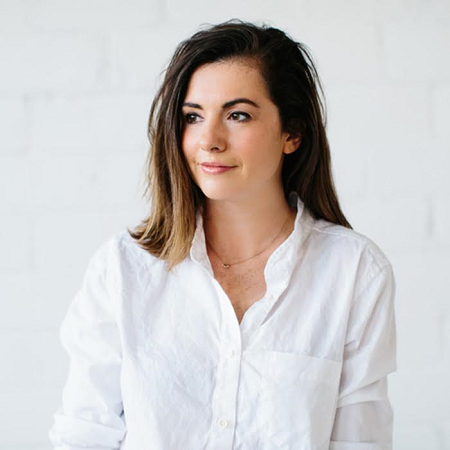 Check out Kate's website here or connect with her on Instagram @witanddelight_. Looking ahead to the spring 2019 season, I think the design trends that will emerge will be bringing in more natural elements into our homes. Natural, organic materials, such as wood floors, stone counters, bare windows to bring in daylight and large plants in natural baskets or stone containers placed on floors in corners and small plants grouped on tabletops and counters. We will also see more bold, geometric and colorful patterns in wall and floor tile, fabric, wallpaper, table linens and wall art. We will also see the colors navy, pink, and dark green used more for color schemes. 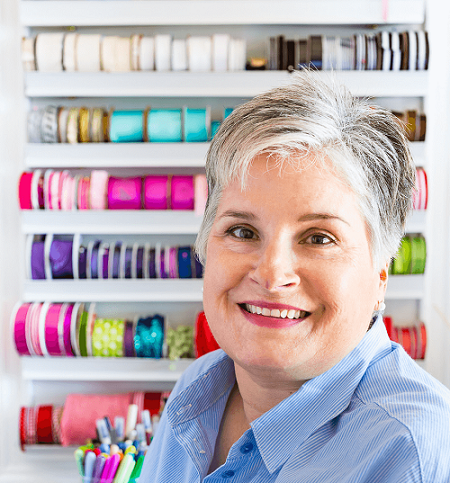 About Diane: Diane Henkler uses the skills and decorating tricks she learned when she worked in retail display to decorate her home. 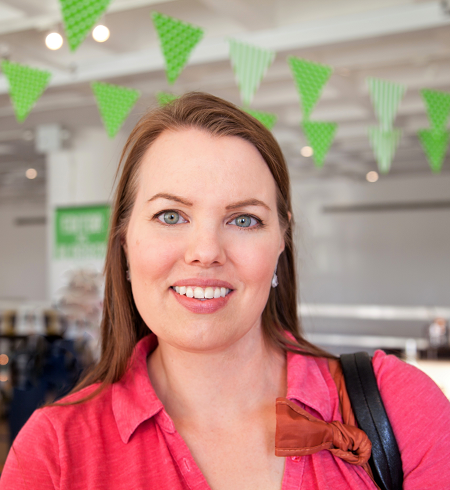 These skills led her to write a book about it entitled, Instant Decorating. The book is no longer in print, but her blog, In My Own Style.com is where she continues to share affordable, creative, DIY decorating and lifestyle ideas. 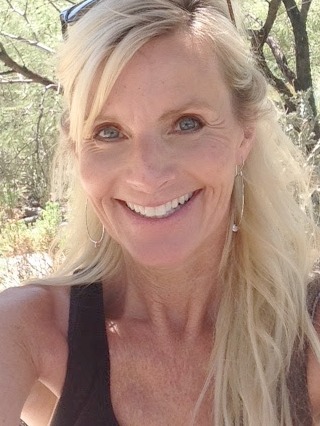 Check out Diane's blog here or connect with her on Pinterest @inmyownstyle. While interior design trends don’t tend to cycle in and out of style as fast as with fashion, updates in the industry happen at a much slower pace. But when they do, they’re seen as refreshing game-changers and sooner than later, everyone’s on board. After a quick survey from Décor Aid interior designers, these were their most mentioned takes on Spring 2019 design trends to take note of. After over a solid decade of clean and serene minimalism surging in popularity, it only makes sense that the industry would lean to the complete opposite; maximalism. Less limiting, the design style boasts both the freedom to be more playful and the chance to layer furnishings for a more opulent feel. Along with maximalism, rich jewel-tones in sumptuous velvets and unique hues like chartreuse are certain to make for a memorable update in any room. Even better when they’re paired with high-shine finishes and metallic extras. Another new trend is slim ‘ribbon’ inspired fireplaces that are less obtrusive and in general, take up much less space. There’s also something to be said about the playful confetti-like blemishes of Terrazzo marble inspiring everything from printed pillows to tea towels to you name it, the sky’s the limit. Finally, from seating to tables, there’s something refreshing about curved silhouettes as an alternative to rigid, more straightforward and formal lines. And while this may be a trend that could feel tired soon enough if you opt for a large curved sofa, you can still get the look by going for accent chairs and tables featuring the silhouette. About Décor Aid: International interior design firm Décor Aid provides clients with premium decorating services centered around their lifestyles and vision while providing a transparent fee structure, a dedicated product manager, and vetted professional contractors, renovation specialists, and paint services. Check out Décor Aid's website here or connect with them on Instagram @decoraid. I love seeing color seep back into homes. I feel like all white kitchens and all neutral/white decor is on it's way out. People are loving moody walls, dark cabinets, and breathing new life into their spaces. Marble backsplashes are another favorite trend I am loving. I also love seeing mixing metals and materials. Wood and metal, Black and gold fixtures. Basically, let's stop playing it so safe and try out new colors and materials! About Angela: Using power tools and design to transform my home and yours. Let's stop pinning and start doing! Check out Angela's blog here or connect with her on Instagram @angelarosehome. There are so many interesting interior design trends gaining momentum in 2019. First, as we become increasingly tethered to our electronic devices and dependent upon technology, we seem to crave more natural and organic design elements within our homes. Second, home decor and objects which may be personalized or are handmade appear to be increasing in popularity. Thirdly, acrylic furniture pieces such as console tables and desk chairs are "in" as are deep moody wall colors and floral patterns for wallpaper and fabric. Finally, in kitchen design, where subway tile has been going strong for the kitchen backsplash, we're seeing bolder statements with "less safe" tiles. About Michele: Hello Lovely is a decor inspiration blog by professional writer, Michele, with lovely interior design inspiration to create timeless and tranquil rooms. Decorating ideas, renovation stories, and designer spotlights feature French country, Farmhouse, and Shabby chic style. More than a collection of home decorating tips, the decor site invites you to say "hello" to a more peaceful milieu at home. 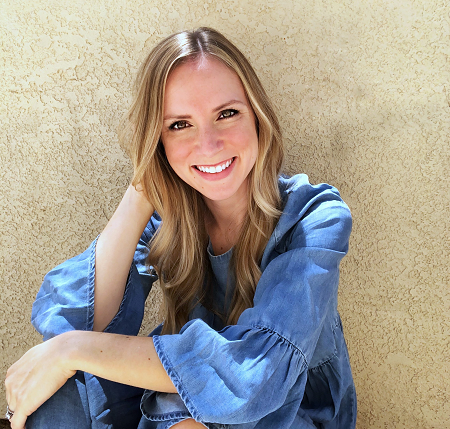 Check out Michele's blog here or connect with her on Pinterest @hellolovelyblog. The biggest new trend I've noticed that will continue into spring is fake plants. Large fiddle leaf fig plants in particular are all the rage right now, in large round baskets. Metallic accents will also continue to be popular, especially rose gold. Maybe we'll see metallic and rose gold Easter eggs this year? About Dagmar: Dagmar's Home is a popular lifestyle blog about creating a beautiful home on a budget. Dagmar writes about farmhouse and thrifty decor, easy DIY projects, and green living, and has 120,000 social media followers. Check out Dagmar's website here or connect with her on Instagram @dagmarbleasdale. I have noticed that the Spring 2019 interior design trends include light and bright spaces with clean lines. White and grey paint colors are very popular right now. This is personally my style, so I love seeing these trends featured on Instagram and blogs. With the light and bright spaces, I have noticed a lot of neutral furniture with accents of bright colored decor like blues. I have seen a lot of marble finishes and accents of gold hardware as well. About Courtney: A Byers Guide is an Alabama-based blog that specializes in affordable fashion, home decor, travel and lifestyle. Check out Courtney's blog here or connect with her on Instagram @abyersguide. Use these refreshing trends to cue your interior intuition and start an invigorating indoor makeover. Now is the perfect time to breathe new life into your home with effortless spring style. Thanks to the impeccable taste of these interior designers, your renewed abode will surely make a statement. Happy spring! Jenna graduated from The University of Texas at Austin with a degree in Public Relations. 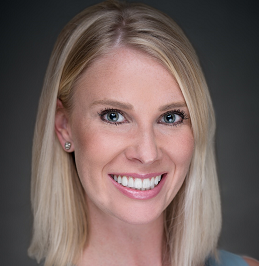 Prior to joining BDX, she worked in digital marketing, nonprofit development and social software sales.